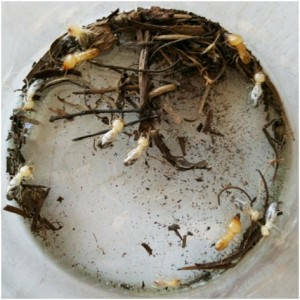 He asked if it was possible to bait them directly in the mulch but trying to place bait directly into the mulch was unlikely to be effective as ants would keep attacking the termites unless they were protected inside their protective tunnels. Even placing the bait in an upside down receptacle could be a problem. The best thing was to offer them TermiteTraps placed in the area so they would be able to build a proper tunnel to the solid timber inside the Traps and seal off the bottom to make it their own humidity-controlled chamber — especially once they also closed the hole in the lid. This would be his indication they had arrived and were ready to be baited. He was advised not to do any gardening or landscaping which may risk severing the tunnels below the mulch that led back to the unknown site of their nest. The Traps were installed and within two weeks, two Traps showed the “we’ve arrived” sig-nal in the lid. He added water to the bait powder and added the cache to the top of the trap after pushing in the mud signal. He was adding new bait every three weeks to the top of the Traps for the first couple of months and it eventually slowed to once every 6-8 weeks then stopped. About four and a half months in total. He waited another two weeks; still no sign of life so he cleaned out the traps and replaced the eaten timber slats and reset the Traps in the same area just in case another colony is developing from the usual springtime colonising flights. This is classic or typical of Schedo and Copto termites found in a mulch situation every-where in Australia.